Resin Bound Surfacing is becoming more and more popular over the last few years, in both commercial and residential applications. Below you will find instructions on how to successfully install your DIY resin Bound kits from SUDwell™. First make sure the concrete or tarmac base is strong enough for it desired use. Ensure that the area is dry and free from dust, Sweeping the area is essential before you start laying you SUDwell™ resin bound surface. Note: Once mixed the resin bound kits will start to cure in around 10-15 minutes so it is essential the the area is prepared before mixing. 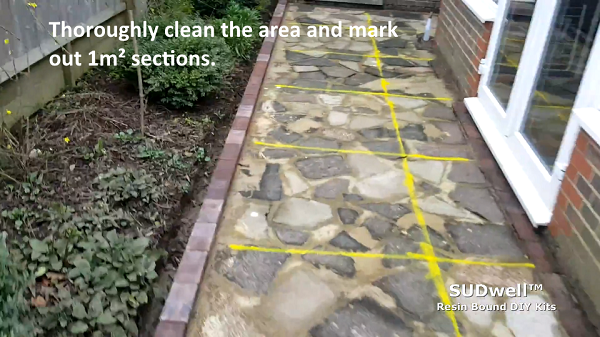 To help you apply the correct amount of resin bound gravel to the area, it is recommended that you mark out a grid of 1m² (0.8m² at 18mm) using chalk or marker paint. Note: Ensure you have a drill and paddle that is powerful and has the capability of mixing mortar mixes. A small household drill will not suffice and may burn out during mixing. 2, Mixing The Resin Bound Gravel. Pour around 1/3 of you chosen stone aggregate from your kit into a normal bucket. Then in the remaining aggregate in the mixing tub create a shallow well (about the size of a pudding bowl). 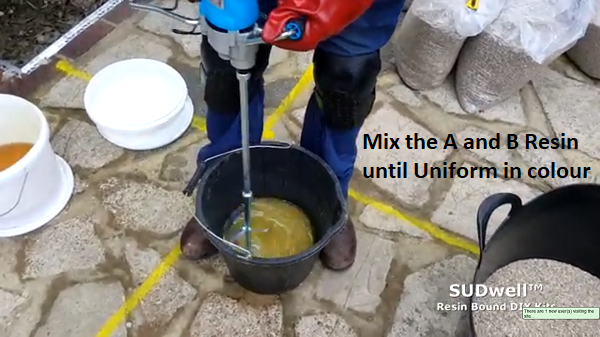 Pour your A and B resin into a seperate bucket and mix thoroughly with a drill and paddle. Mix for a couple of minutes until the resin becomes uniform in colour. Tip your combined resin into the well you created in the mixing tub, and add the stone you removed earlier back on top of the resin and stone. 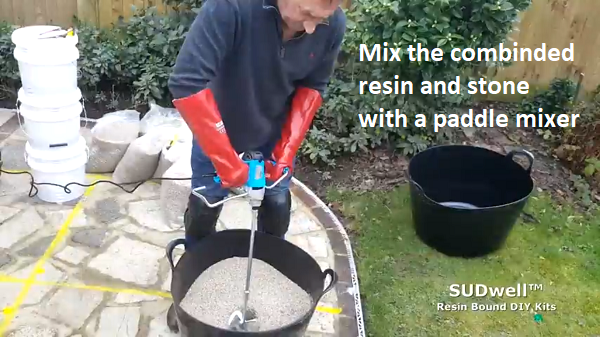 Mix the stone and resin together for a couple of minutes, ensuring that all the stone in the mixing tub is coated with resin and has a wet appearence. 3, Laying your resin bound surface. Slowly pour your mix over the area to be covered making sure there is no dry stone in the mix. If there is a significant amount of dry stone, shovel it back into the mixing tub and mix again. If there is a small amount of dry stone you can mix it into the poured stone ensuring that it becomes coated and wet looking. 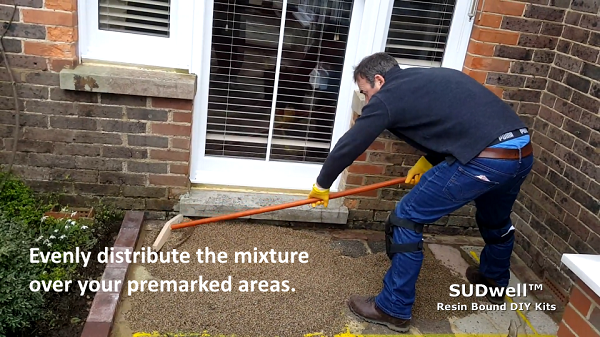 Level out your resin bound mixture over the desired area using a squeegee or shovel. Then float out the material using a plasterers float, this may take around 5 or 6 passes until you are happy with your finish. 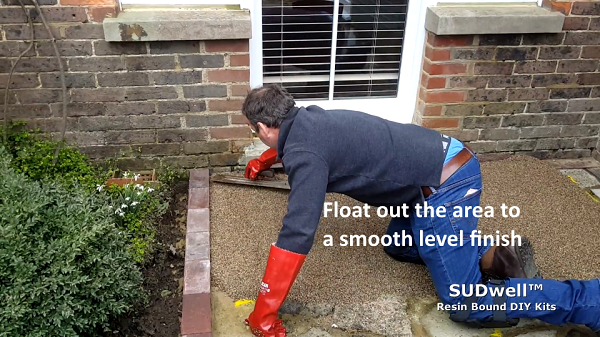 Note: you only have 10-15 minutes (30 minutes with SUDwell™ All Weather Resin) before the resin starts to cure so speed is of the essence (especially during warmer periods). Tip: Lightly spraying your float with water every 30-40 seconds will aid you in the floating process. You can use a household cleaning spray bottle, but it must be thoroughly rinsed out several times so it is free from contamination. Repeat the above process until your project is finished. SUDwell™ have been at the forefront of both supply and installation of resin bonded and resin bound surfacing products for over 15 years, and to meet customer demand, sell a range of diy decorative stone and resin DIY kits for your driveway, path or patio.